ClickMeeting is a browser-based web conferencing tool with robust features designed to make online meetings and webinars very productive. Designed to connect people regardless of location, operating system, or time zone, ClickMeeting is a great tool for communication and collaboration for large businesses and organizations with team members based in remote locations. Presenters and attendees can easily link with each other and start ad hoc meetings or deliver presentations, share YouTube videos, or share the screen to get their point across. Reach out to literally millions of people all over the world to promote your product, service, or brand. Present your products or services as well as other information to potential customers with just a few cost, time, and effort on your part. Increase lead generation and enhance business sales. Offer exclusivity on your product demos and create buzz for your brand and company. Enliven training with your agents, staff, and student through crisp and live webinars. Organizations have diverse wants and requirements and no software application can be just right in such a scenario. It is useless to try to find an ideal off-the-shelf software system that meets all your business needs. The smart thing to do would be to customize the system for your specific wants, worker skill levels, finances, and other elements. For these reasons, do not rush and pay for well-publicized trendy applications. Though these may be widely used, they may not be the perfect fit for your specific wants. Do your homework, check out each short-listed platform in detail, read a few ClickMeeting reviews, call the vendor for clarifications, and finally choose the product that presents what you need. How Much Does ClickMeeting Cost? We realize that when you make a decision to buy Communications Software it’s important not only to see how experts evaluate it in their reviews, but also to find out if the real people and companies that buy it are actually satisfied with the product. That’s why we’ve created our behavior-based Customer Satisfaction Algorithm™ that gathers customer reviews, comments and ClickMeeting reviews across a wide range of social media sites. The data is then presented in an easy to digest form showing how many people had positive and negative experience with ClickMeeting. With that information at hand you should be equipped to make an informed buying decision that you won’t regret. Not reliable, but I guess you get what you pay for. A functioning tool at a decent price. A seamless webinar riddled with some bugs. Everybody should start using this for their webinars. What are ClickMeeting pricing details? What integrations are available for ClickMeeting? Pros: I find it to be user-friendly. Learning curve is nothing once you dip your feet in the water. Effective once you start using it. You'll wind up finshing content in no time. Cons: It's hard to come up with something to not like with this product. It just works. Pros: The price, the automation of services like post-event surveys, post-event display of the upcoming webinars they can register for, templates and some easy (restrictive, but easy) customizations for branding. Cons: Very unreliable. Despite listed supported browsers, attendees experienced problems joining, hearing the presenter, and seeing the screen. The screen share application is not built-in and has a weird thing that ClickMeeting knows where the mouse will always display on the shared screen, even if you've taken your mouse to a different (non-shared) screen. The screen sharing application is super laggy. ClickMeeting always blames yours or attendees connection, but its definitely not. One time their server crashed right before beginning a webinar. ClickMeeting suggested to upload presentations to help reduce the lag, but after uploading a PPT, it distorted some images on the slides and of course can't keep animations so you'd have to essentially create a PDF of your presentation to upload (which might be fine). Other bugs that I reported and they addressed. Their support is the only good and reliable thing about this company, although it did take them over a week to at least address my reported concerns. Oh also, dial-in attendees show up as a separate participant (not connected to the browser join. So your stats will be off by every dial-in where you have 7 people join and 2 dial-in. Your stats will report you had 9 people join... Same goes for the presenter, you don't see the presenter talking that dialed-in, you see the phone number used to dial-in. Lastly, webinars should have private chat options, not this moderated thing where it seems to make sense for Meetings, but not most webinars. Meetings are a breeze to make. This platform ensures you don't struggle doing it. Webinars are made by means of a step-by-step method. Essentially, everything seems easy. Group meetings and an MBA Webinar with this. Its features and storage are online based. No installations offline are needed. Features speak for themselves. 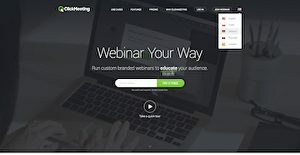 A fantastic approaxh in hosting webinars. Feature-packed and valuable to own. It was inexpensive and the agreement was for month-to-month.